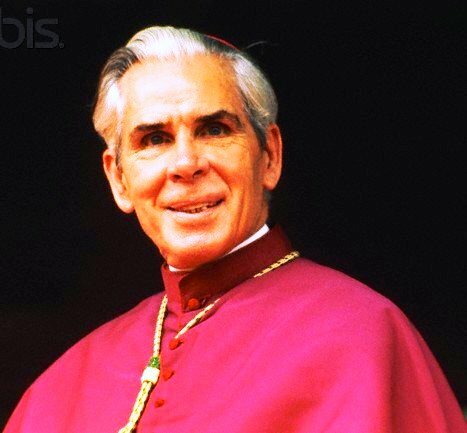 What a great man Archbishop Sheen was. He was probably the most visible Catholic to many Americans in the 1950's. He helped reduce the amount of prejudice toward Catholics by combining a great sense of humor, religion, and philosophy into a great 30 minute TV episode, called "Life Is Worth Living". He was a virulent anti-Communist, and was also a great American. Born May 8, 1895 in El Paso, Illinois, he went on to become the biggest single Catholic presence on radio and TV in the 20th century, at least until Mother Angelica and EWTN arrived on the scene in the 1980's. He was ordained as a priest in Peoria, Illinois in 1919. In 1930 he began his broadcast career, hosting the Sunday evening Catholic Hour program on NBC Radio. The rest is history. 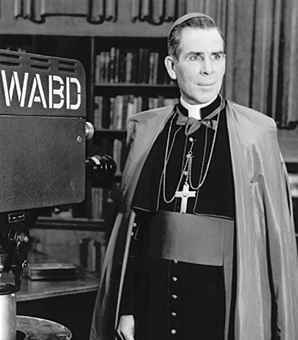 Radio, books, TV, and numerous speaking engagements around the world made Archbishop Sheen a one-man catechism, for Catholics and non-Catholics alike. He was placed on TV in a death slot, opposite Milton Berle, one of the highest rated comics of the 1950's. He went on to get 20 million viewers on 123 TV stations, receiving the Emmy Award for "Most Outstanding TV Personality". Today, he even has his own website where you can purchase his shows and recordings. He died in 1979, after being told by Pope John Paul II that he had been a loyal son of the Church, and that he had spoken well. His case for sainthood is now being considered. May that great event happen soon, AMEN! Below are a few of his most famous quotes..."GOD LOVE YOU!" "The Rosary is the best therapy for these distraught, unhappy, fearful, and frustrated souls, precisely because it involves the simultaneous use of three powers: the physical, the vocal, and the spiritual, and in that order." "The Soviet Union is like the Cross without Christ, while American culture is like Christ without the Cross." "Fasting detaches you from this world. Prayer reattaches you to the next world." "Hearing nuns' confessions is like being stoned to death with popcorn. " "I feel it is time that I also pay tribute to my four writers, Matthew, Mark, Luke and John. " "It's like being a Knight of the Garter. It's an honor, but it doesn't hold up anything. " "Jealousy is the tribute mediocrity pays to genius. " "Life is like a cash register, in that every account, every thought, every deed, like every sale, is registered and recorded. " "Love is a mutual self-giving which ends in self-recovery. " "Pride is an admission of weakness; it secretly fears all competition and dreads all rivals. "The Church is like Noah's ark that was full of both clean and unclean animals. It must have had an unholy smell, and yet it was carrying eight persons to salvation. The world today is tearing up the photographs of a good society, a good family, a happy, individual personal life. But the Church is keeping the negatives. And when the moment comes when the world wants a reprint, we will have them." "The big print giveth, and the fine print taketh away. " "This brings us to our second point: namely, why the Blessed Mother, in the 20th century, should have revealed herself in the significant little village of Fatima, so that to all future generations she would be known as Our Lady of Fatima. Since nothing ever happens out of Heaven except with a finesse of all details, I believe that the Blessed Virgin chose to be known as Our Lady of Fatima as a pledge and a sign of hope to the Moslem people, and as an assurance that they, who show her so much respect, will one day accept her divine Son too. Evidence to support these views is found in the historical fact that the Moslems occupied Portugal for centuries. At the time when they were finally driven out, the last Moslem chief had a beautiful daughter by the name of Fatima. A Catholic boy fell in love with her, and for him she not only stayed behind when the Moslems left, but even embraced the Faith. The young husband was so much in love with her that he changed the name of the town where he live to Fatima. Thus, the very place where our Lady appeared in 1917 bears a historical connection to Fatima, the daughter of Mohammed." "Truth must be sought at all costs, but separate isolated truths will not do. Truth is like life; it has to be taken on its entirety or not at all. . . . We must welcome truth even if it reproaches and inconveniences us -- even if it appears in the place where we thought it could not be found." "Nothing is more harmful to a man than his resistance to Grace." "So much do the will and its sin become wedded together that a soul will say, Let me alone. I made my bed and I will lie in it." "Those who hate Truth and fear Goodness are not far from the kingdom of God. They are fighting against it, and yet they know theirs is a losing battle. The more violently men hate truth, the more they think about it; the more they fear the goodness that demands perfection, the more they know it is what they really seek." "Once we accept him, we find we were truly deceived. It was only the skin of the heavenly fruit that seemed bitter. The meat ravishes the soul. . . At first glance, God seems to be taking away our happiness, but in the moment of surrender we discover he has deceived us. He has merely taken away the dross to give us the gold of his eternity." "Sin was the act by which man refused to see created things for what they were -- stepping stones to God, a means to an end -- and began instead to clutch at them as ends in themselves. That is what sin is, still. As a man loves his sense of humor when he cannnot see the point of a pun, so he loses his humor in its entirety when he ceases to see the point of the universe, which is that all things are revelations, symbols, reminders of God who made them. To take things as ends in themselves is to overrate them, treating them with a solemnity which is not warranted." "Every person carries in his heart the blueprint of the one he loves."